Life NK Daily Fix Muscle Relief Bath Soak // Although I still love the Mio Liquid Yoga, this version from Life NK has been a nice, cheaper, alternative until I repurchase LY. It has more of a shower gel/bubble bath consistency so it does actually create some bubbles. It smells heavenly and really does help to soothe away tension and aches. It looks like it's sold out at the moment but if they bring it back then it's a must try especially if you can get it for the bargain price of £4 like I did. I may have also bought a couple more bottles! Bumble And Bumble Sunday Shampoo | £18.50 // Recently, I have no idea why, but whenever I wash my hair I feel like it's never really clean and it'll get greasy quicker than it used to. I'm pretty sure it's not down to product build up as I don't really use a lot but I decided to buy a deep cleaning shampoo anyway. I feel like I've talked about this shampoo from Bumble And Bumble a lot recently but I really love it and that's quite rare for me to love a shampoo as I have such a sensitive scalp. This doesn't dry out my hair or scalp and my hair doesn't feel stripped but just nicely clean when I use it. I'm about three quarters of the way through this bottle and I will definitely be buying another one when it's empty. REN Tonic Moisture Mist // Unfortunately this looks like another product that is no longer available. 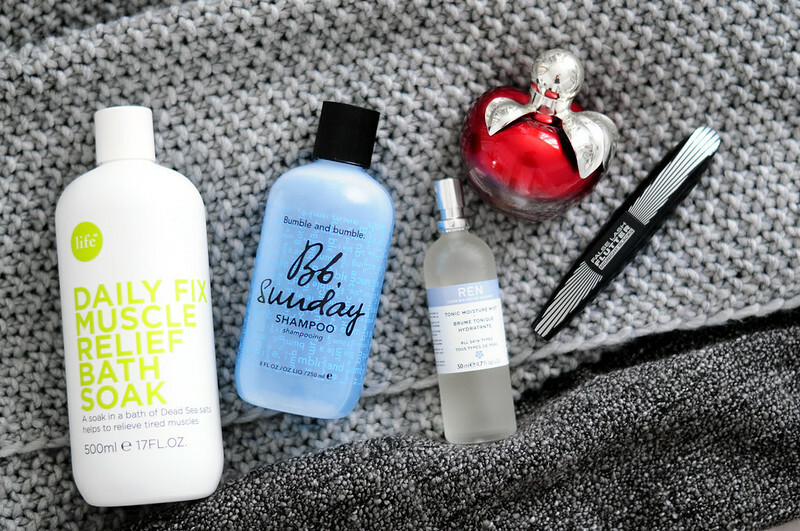 I first tried this hydrating toner a few years ago, fell in love with it and then found out it had either been discontinued or just out of stock every time I looked. I saw this smaller bottle in the Space NK sale at Christmas and added it to my basket straight away. It still looks like it's out of stock everywhere but I'm happy to have it in my routine again. This is the perfect toner to use after an acid toner and it really helps to keep my skin moisturised. It also feels amazing to apply especially in the mornings as it really wakes you up. In the evenings I tend to spray it into my hands and then pat it into my skin. Nina Ricci Nina L'Elixir Perfume | £32.99 for 30ml or £44.50 for 50ml // I bought the original Nina perfume in duty free when I went to New York in 2007 so this scent brings back so many memories from the trip. I also love that the bottle design is an apple and once I've finished it, it'll take pride of place next to my I heart NY mug and framed sky scraper print. I wanted to have the perfume in my collection again but decided to buy the eau de parfum so it would last longer. The notes are red toffee apple, sembac jasmine, red berries, lime, lemon, white cedar, cotton musk and warm amber. It's the perfect spring scent and I've fallen back in love with it. L'Oreal False Lash Flutter Mascara | £10.99 // I really like L'Oreal mascaras, particularly the ones with plastic wands, so I thought I'd try this one. Each side of the wand is a different shape but I only tend to use the longer side as the other creates clumps. I really like the tapered shape of the wand as it fits my eye shape perfectly and helps to extend my lashes to the outer eye. It holds a curl well and also adds volume and length. The only downside is that it seems to dry out pretty quickly and I haven't had it for too long.